I hope you all had a nice Thanksgiving weekend. We ate a lot, did a little shopping, and just relaxed with family. All in all, it was a great long weekend. As I’m typing this, I am surrounded by all of our Christmas decorations that are patiently waiting to be put in their spot. I love to change it up a little year after year with my Christmas decorating. I am loving the little snap of cooler weather because that means it is soup time in my family. I usually make a big pot early in the week, and that is what we eat for lunch during the week. Since my family has gotten bigger appetites as the little girls are growing up, it doesn’t last as long as it used to. I guess that just means I’ll get to try out more soup recipes! In a large soup pot over medium heat, cook bacon until crisp. Remove the bacon from the pot with a slotted spoon and set aside. Drain all but 1 tablespoon of the bacon grease. Add the butter to the pot and melt. Add the onion, carrot and garlic. Cook for about 5 minutes until the veggies are soft and the garlic is fragrant. Slowly add the chicken stock, whisking to combine. Reduce the heat to a simmer, cook partially covered with the lid, for about 20 minutes until the potatoes are tender. Add the shredded cheese 1 handful at a time, stirring gently after each addition until melted. Slowly add the heavy cream and continue stirring until combined. 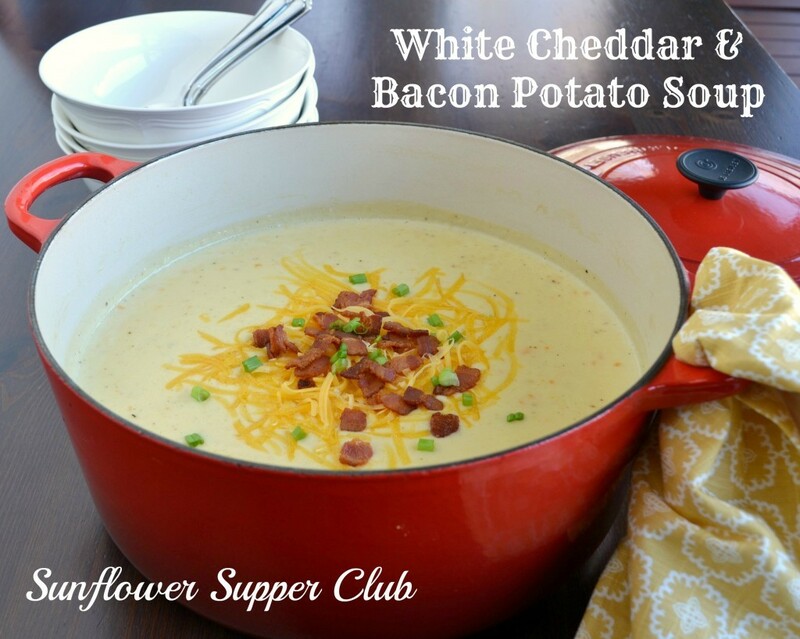 Ladle soup into bowls and garnish with chopped bacon, green onions or chives, and sour cream.